Suiseki (Sui = water, Seki = stone) is the study and enjoyment of naturally formed stones as objects of beauty. The art of Suiseki involves the collection, preparation and appreciation of unaltered naturally formed stones. These stones are found in mountain streams, on windblown deserts, along ocean beaches - anywhere that nature may have deposited or shaped them. They are chosen to represent part of a scene in nature, Mountains, waterfalls, caves, or they may represent objects, men animals, boats, huts, or they may just be uniquely patterned, Japanese chrysanthemum stones are probably the best known example of these. 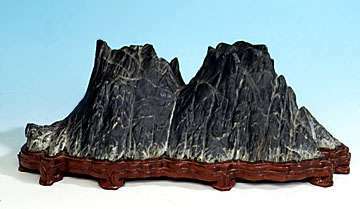 As with Bonsai, Suiseki was first practiced by the Chinese during the Song Dynasty (960 - 1279), and are generally referred to as Chinese Scholars Stones. As trade and contact between China and Japan flourished in the middle ages, the Japanese adopted and adapted the art form to their own culture, and like bonsai have set guidelines and refined the art. Due to this Japan is thought of as the mother nation of Suiseki. Suiseki are often seen at Bonsai shows either to compliment a Bonsai on show, or as a separate display in themselves. In recent years appreciation for Suiseki and Chinese Scholars Stones has spread far beyond Asia and collectors are active in many countries, and exhibits are held in cities throughout the world.